Welcome back from the Red Menace! It’s an aggro world, and we’re all just living in it. The Pro Tour win by Ramunap Red (albeit with a very big oopsie in the quarterfinals by his opponent) meant that several cards have spiked and spiked hard and some of them we saw coming. The time for picking up cards for a big profit has passed, and it remains to be seen how many of these cards are going to keep their new price levels. This week, I want to look at how such gainers have done after previous PT success, and see how that bodes for the cards which has seen such impressive gains in value. Before I get into the cards that spiked this weekend, I want to step backwards a couple of Pro Tours and see what patterns might exist. Pro Tour Amonkhet had Zombies rising (couldn’t help myself) and Aetherworks Marvel all over the place, along with a healthy dose of Mardu Vehicles. Fatal Push cemented its status as a $7 uncommon, though its playability in Eternal formats is a big contributor there. There weren’t a lot of Amonkhet cards in these top decks. Lord of the Accursed was a four-of uncommon, and Dread Wanderer went from $2 up to $6 and has trailed back down to $2 now. 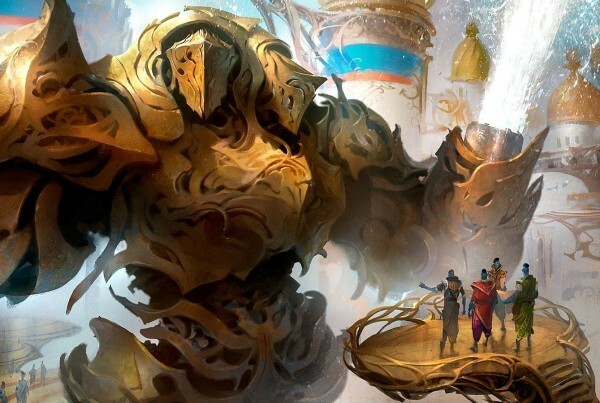 Pro Tour Aether Revolt had six Mardu Vehicles decks in the top 8. Notably, Heart of Kiran jumped to above $20 and has since been trickling downwards in price ever so slowly, as other decks have become more popular. It’s now $11 or so, and having only put two copies of the top 16 at PT Amonkhet, it didn’t bump up even a little. I wrote the dates on the graph because I’ve never seen a card spike this many times in just a year. Will it keep doing so? Will it go up with each of the four Pro Tours left in its Standard lifespan? There’s even a minor bump for this recent PT, even though Gearhulk decks weren’t really a factor. It’s also the outlier. Most cards that jump up in price at a big tournament have prices go back down, whether fast like the Gearhulk does, or slow, like Liliana, the Last Hope has. Ramunap Ruins (Now $1.25, was $0.25, foils now $6): I can buy that this is a $1.50-$2 uncommon, as a four-of in the most popular deck. I do not understand this foil price at all. That level of foil multiplier is usually indicative of wild demand in casual or Eternal formats, and it’s just not popular. Commander doesn’t want this. Shivan Gorge will do half the damage but not lose you lands (and a specific land type at that). The Gitrog Monster decks can’t play this. Are people speculating that it’ll be good enough in Modern? I find that unlikely as hell. Please, enlighten me as to why this is such a pricey foil, and if you have a foil, I’d get rid of it ASAP. I expect the nonfoils will end up at about $1, but if this deck spikes an event around Christmas, when the set is no longer being opened, it’ll hit $2 again. Abrade (Now $3, was $0.75, foils $10): Again, I like this to stay as a pricey uncommon, even with the large amount of Game Day versions about to enter circulation, and if you think $10 is too much for a foil uncommon, the multiplier is with normal tolerances. I do love the flexibility in Cubes and Commander, as these are both effects you want access to. I think this set of prices will stay consistent for some time, and keep in mind that this will rotate out of Standard at the same time as the Vehicles block, so there will always be a good level of demand for the card. 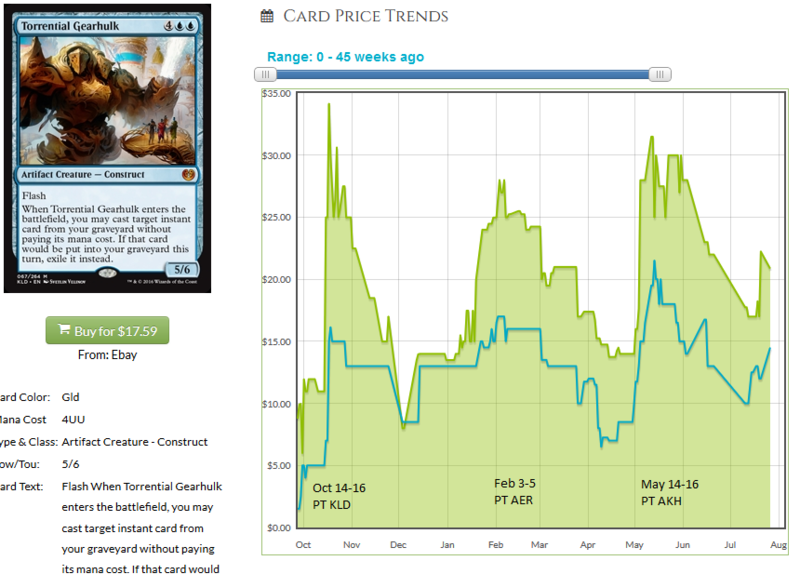 Falkenrath Gorger (Now $2.50, was $0.50, foils $3.50): The price graph here is going to be a sad one. People are racing to the bottom on this card, as fast as they can. TCG has seven available for under $1, and a very large number under $2. It’s about to rotate, people have dug this out of bulk boxes, and it’ll crash back at bulk by rotation. Hazoret the Fervent (Now $16, was $6, foils $25): I don’t agree with Travis that the time to sell is already past. Yes, there was a moment where it listed for $20, but if you got in at $7 or less you’re still making a fine profit. It’s in the process of trickling downward, yes, but if you have your copies, don’t panic-list them at $10 each or something. If Ixalan offers us one or two good cheap red creatures the deck will remain a strong part of the metagame. Gorger is rotating, as is Village Messenger, but I don’t think this goes below $12. I doubt we’re going to see the bouncing price of Torrential Gearhulk, but right now people are planning for the deck. We will have a period where the meta adjusts, and people stop playing it, and then the red menace comes back to prey on all the slower decks. If the price goes below $10 again, I’ll have to think about picking more up. It’s got a limited time to be good, but we’ve already seen what it’s capable of. Cliff is an avid watcher of just the draft part of the Pro Tour, but the games themselves are far less enthralling. He has been playing this game since late 1994, and making money off of it for far less time. You can find his insights on Twitter @wordofcommander or here on MTGPrice every Friday morning.